Linda: Welcome and thanks for joining me today. 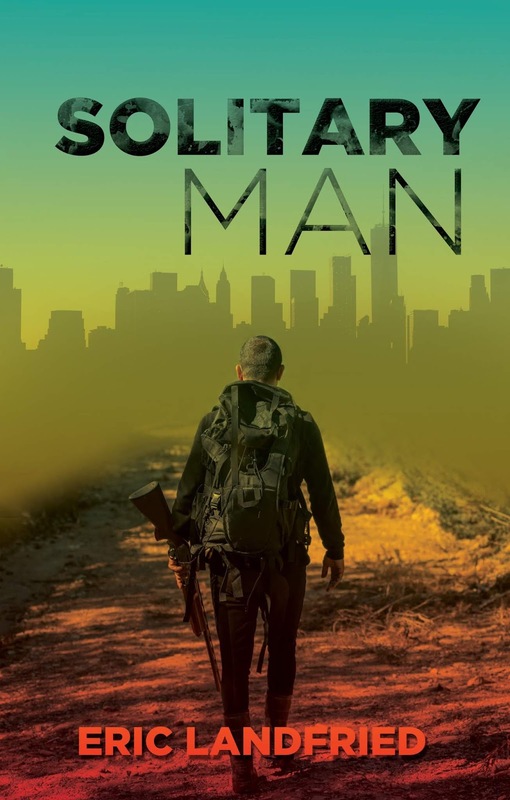 Congratulations on the release of your debut novel, Solitary Man. According to your website you’ve had stories “bumping around in your head” since you were a teen. How did you decide which novel to finish and what was your inspiration for the story? Eric: Solitary Man came about as I was thinking about the Mad Max films and other post-apocalyptic stories and noting the lack of Christian or even religious characters. And if they did have them, it was typically some lunatic used for comic relief. That’s when I had the thought of dropping a faithful Christian into a universe like that and imagining what it would look like. Once this idea came to me, it really developed and came together so quickly that it pushed all other ideas to the back of my mind and I zeroed in on writing it. I had knee surgery in early 2015 and was unable to work for three months, and that’s when I really attacked the story, banging out the first complete draft. LM: How did you come up with your characters? Are they based on any real people in your life? Eric: Since the idea came from movies I’d seen, I initially envisioned Solitary Man as a screenplay, but the story kept growing and I soon had too much for a single movie to hold. That movie connection inspired my vision of Doyle, a tough, older man who I based on older versions of the 80’s action heroes I grew up watching like Schwarzenegger or Stallone. On the other hand, the character of Jonathan is basically me injecting myself into the story, though Jonathan is far more courageous in proclaiming the Gospel than I am. The funny thing about that is that my wife says she sees me in both characters. LM: Research is an important part of writing. How did you go about researching Solitary Man and did you find any special tidbits you knew you had to include? Eric: I was aware that Navy SEALs were tough soldiers, so I decided to make Doyle a former SEAL. To learn more about them, I read Warrior Soul by Chuck Pfarrer, a memoir of Pfarrer’s time in the SEALs. He had some interesting moments like local tough guys coming into the bar where they were hanging out and trying to pick fights with the SEALs. That kind of inspired the character of Hawk who becomes a thorn in Doyle’s side. Since I include a scene where Jonathan debates someone who is somewhere between agnostic and atheist, I studied up on apologetics, focusing in on the presuppositional apologetics of men like Cornelius Van Til and Greg Bahnsen. I also read John Piper’s A Peculiar Glory which explains how the Bible proves itself to be true. I incorporated many points and facts from these resources into the story. LM: What is something you want your readers to know about your main character? Eric: It was important to me that both my lead characters feel like real people. I knew that as a Christian, Jonathan would have plenty to offer Doyle, but I wanted Doyle to be able to teach Jonathan as well. This is why I gave Jonathan a theological blind spot that Doyle, even as an unbeliever, would be able to notice and explain its inconsistency when comparing it to the rest of Jonathan’s faith. So I guess I want the readers to realize that these two men are both broken sinners, and therefore not everything they do is perfect, but one has trusted in the perfect sacrifice of Jesus, and it makes all the difference in the story. 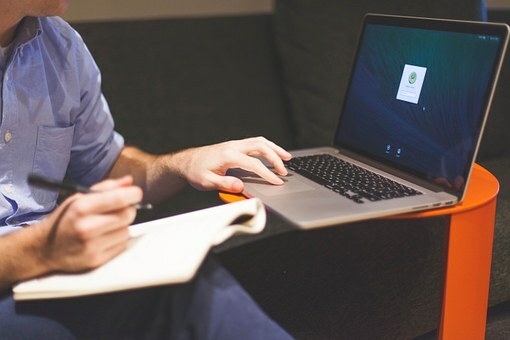 Eric: My day job, my family, and my church eat up a lot of time, so finding writing time was hard until I forced myself to be disciplined about it. Every weekday, I get up at 5 AM when no one else is awake and I sit on the couch with my laptop (feet propped on the antique trunk we use for a coffee table) and I write. I use dictation software since my brain thinks much faster than my fingers can type, and since I’m wearing a headset, I’ll usually stream some music as background noise. I typically get about 60 to 90 minutes of quiet time, and each day is different. Sometimes I’m on a roll and knock out a thousand words and sometimes it’s just a few hundred. The important thing is that it’s progress. Even when I’m doing research and get no writing done, it’s still progress as long as it’s contributing to the story. LM: What one thing would you like to learn how to do? Eric: I don’t think there’s a burning desire for anything at this point, but I’ve always been fascinated with movies and filming, so I would definitely be interested in learning that process and maybe someday directing my own film. Favorite author: Again, hard to choose, but there’s something about Mark Twain that keeps me coming back to his books. Favorite food: Hand me a bacon cheeseburger with all the right toppings, and I’ll be your best friend for life. 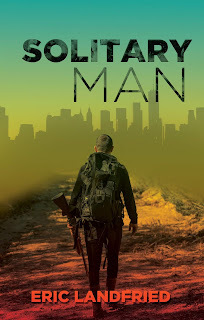 Eric: I’m currently 25,000 words deep into a sequel for Solitary Man. As of right now, it’s untitled, but I’d like to stay with the __________ Man theme. Just need to find the perfect adjective. It pretty much had to be next because while Solitary Man has what I believe is a satisfying ending, there will be questions in the readers’ minds, and I’m nice enough to not keep them waiting any longer than I have to. 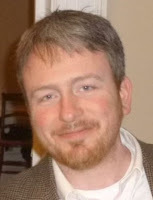 Eric: Folks can find me on Facebook (@ericlandfriedauthor), on Twitter (@e_landfried) and on Instagram (@ericlandfried). As far as getting Solitary Man, they can order from Amazon, Barnes & Noble, and Christian Book Distributors. They can also visit my website (ericlandfried.com) and order signed copies directly from me. And of course, they’re welcome to email me at eric@ericlandfried.com. Ten years after a brutal war, cannibals and humans fight over the pieces of a hardscrabble existence. Former Navy SEAL Doyle has been prowling the broken remnants of a devastated America for years. Alone in an armored bus loaded with weapons and supplies, he’s grateful for his solitude. Being alone makes it easier to survive, as others can become a liability in the end of the world. But when a particularly brutal attack leaves Doyle in need of fuel and repair, he has no choice but to venture into the nearest settlement. Thanks so much for this interview, Linda and Eric. How fascinating — dictation software. Congrats on your debut book! I know it will do well.